Torino produced their finest performance of the season as they beat Roma at home for the first time in twenty-three years on Sunday afternoon. Andrea Belotti started his first game since August after returning from injury, whilst Luca Rossettini, Joel Obi and Marco Benassi all came into the starting eleven. Roma started brightly and Belgian midfielder Radja Nainggolan fired an early warning to Joe Hart's goal, but his fierce shot went narrowly wide of the post. However it was Toro who took the lead within ten minutes when Joel Obi's excellent cross was headed home by the returning Andrea Belotti. Belotti was causing major problems for the Roma back four, and his excellent hold up play allowed Iago Falque to get two strikes on goal, but he was denied by the post initially, and then Wojciech Szczesny. Szczesny had to be at his best moments later when the impressive Lucas Boyé played in Andrea Belotti's whose shot was turned around the post by the Polish keeper. Luciano Spalletti turned to his captain Francesco Totti who came on at half time for the giallorossi, and he was given a standing ovation by the home supporters in what is likely to be his last ever appearance at the Stadio Grande Torino. Joe Hart denied his former Manchester City team mate Edin Dzeko an equaliser in the early stages of the second half, although the Bosnian probably should have scored. Roma were made to pay for that miss when the home side were awarded a penalty as former Toro defender Bruno Peres upended Andrea Belotti. After Belotti's recent failures from the spot, on loan Roma winger Iago Falque took responsibility and the Spaniard made no mistake to double Torino's lead. However, Roma halved the deficit just two minutes later when they were awarded a penalty of their own when Lorenzo De Silvestri tripped Diego Perotti. Francesco Totti stepped up and sent Joe Hart the wrong way to give the away side hope. But this was to be Torino's afternoon, and the Granata extended their lead when Andrea Belotti set up Iago Falque who scored his second goal of the game thanks to a huge deflection from Federico Fazio. 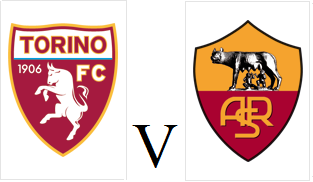 Toro had chances to increase the margin of victory with Davide Zappacosta and Josef Martinez both going close, but three goals were enough to seal Torino's second victory of the season. After two successive 0-0 draws, Torino will be looking for a second win of the season when they host Roma on Sunday afternoon. Toro will be without the suspended Afriyie Acquah and Giuseppe Vives who were both dismissed in mid-week at Pescara. However, the Granata will be boosted by Andrea Belotti's return to fitness, and he should start in this game. Former Torino favourite Bruno Peres moved to Roma in the summer and has helped his new side to three victories in their opening five games - the most recent of which was a 4-0 thrashing of Crotone on Wednesday. Torino had to play the last ten minutes with only nine men but still managed to hold on for a deserved point on a crazy night in Pescara. Mattia Aramu made his Serie A debut for the Granata, whilst Davide Zappacosta, Emiliano Moretti Giuseppe Vives and Daniele Baselli all came into the starting eleven. Joe Hart made a good save from Valerio Verre's long range shot after Daniele Baselli's careless pass presented the ball to the midfielder. Josef Martinez had the best chance for Toro in the first half after good work from Lucas Boyé, but the Venezuelan could not find the target from a difficult angle. On the stroke of half time, Afriyie Acquah received a second yellow card for a reckless challenge on the half way line. Despite that setback, Toro were creating chances on the counter attack in the second half - but once again had Joe Hart to thank for his save from Ledian Memushaj. With ten minutes left, Toro had a second man sent off when Giuseppe Vives received a straight red card for his cynical trip on Alexandru Mitrita. Incredibly, nine man Torino almost took the lead when substitute Andrea Belotti broke clear but his low effort rebounded off the post. It looked as though Toro's brave resistance would be broken in the dying minutes, but Cristiano Biraghi somehow missed a free header from close range and Toro held on for a point. 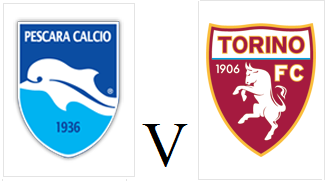 Torino will travel to newly promoted Pescara on Wednesday afternoon in search of their first away victory of the new campaign. Cristian Molinaro suffered a long term injury in Sunday's draw with Empoli so he will be replaced by youngster Antonio Barreca, whilst Marco Benassi and Daniele Baselli will be pushing for starts in midfield. Adem Ljajic will still miss the game through injury, but Andrea Belotti could make an appearance if he passes a pre-match fitness test. Pescara currently have four points from their opening four fixtures, however three of those points were awarded to them after Sassuolo were found to have played an ineligible player. In their first two home games of the season, Pescara recorded a creditable 2-2 draw with Napoli and were only defeated by Inter in the dying seconds. Torino really felt the absences of injured duo Adem Ljajic and Andrea Belotti as they could only manage a disappointing draw at home to Empoli on Sunday afternoon. Joe Hart made his home debut for the Granata, whilst Joel Obi, Afriyie Acquah and Lucas Boyé all came into the team. The Nigerian midfielder Obi had the first chance of the game for the Granata, but his shot was tipped round the post by Lukasz Skorupski. A driving run into the box from Afriyie Acquah led to the former Parma midfielder receiving the ball back from Iago Falque's cross - but he headed wide of the target. Cristian Molinaro was forced off the field with a serious injury and he was replaced with youngster Antonio Barreca who immediately created a chance for Boyé, but the Argentine blazed the ball over the bar. Boyé was looking bright in his first start of the season, and on the stroke of half time he forced a save from Skorupski from a tight angle. After barely creating a chance in the first half, Empoli looked much brighter in the 2nd half and should have taken the lead but Alberto Gilardino failed to make contact with the ball from close range. Joe Hart made a vital intervention from Manuel Pucciarelli having previously made a good save to deny full back Vincent Laurini. After a disappointing second half in which Toro struggle to create chances, the Granata had to settle for a point. 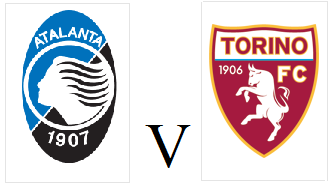 Torino lost their second game of the season, as despite leading, they were beaten 2-1 by Atalanta on Sunday afternoon. Joe Hart made his Toro debut, whilst Josef Martinez and Maxi Lopez replaced the injured duo Adem Ljajic and Andrea Belotti. Both sides had chances to take the lead just before the break, firstly Cristian Molinaro was denied by Sportiello's legs and then Kessié somehow missed the target from only three yards out. Toro took the lead ten minutes into the second half thanks to Iago Falque's fine free kick, although Sportiello probably should have kept it out. However the lead lasted less than two minutes as debutant Hart failed to claim a corner kick, and diverted the ball into the path of Andrea Masiello who turned the ball into the back of the net. Lucas Boyé and Falque both had half chances to give Toro the lead, but with ten minutes remaining, the home side were awarded a penalty when Lorenzo De Silvestri tripped Alejandro Gomez. Hart was unable to make amends for his earlier error as the excellent Kessié sent him the wrong way from the spot to give Atalanta their first points of the season. On loan goalkeeper Joe Hart is in line to make his Torino debut when the Granata face a tough trip to Bergamo on Sunday afternoon. The England international has made a good first impression with his new teammates, and coach Sinisia Mihajlovic has revealed that he has already learnt a few words of Italian. However, Mihajlovic has other worries due to an injury crisis up front with Andrea Belotti, Maxi Lopez and Josef Martinez all potentially out. Therefore, youngster Manuel De Luca has been called up to the squad for the first time. The home side have lost both of their league fixtures this season, but young midfielder Frank Kessié has impressed and has already scored three times.